Femme Fatale Records Proudly Presents Early's Blues Harp Pick of the Month! THE ONE EYED CATS blues harp player Early A King$ has chosen MY BACK SCRATCHER by FRANK FROST as his favorite blues harp song for May. You can check it out by clicking HERE! THE ONE EYED CATS blues harp player Early A King$ has chosen CRAWLBACK by FRANK FROST as his favorite blues harp song for April. You can check it out by clicking HERE! THE ONE EYED CATS blues harp player Early A King$ has chosen CUT IT OUT by WILLIE BROWN as his favorite blues harp song for March. You can check it out by clicking HERE! THE ONE EYED CATS blues harp player Early A King$ has chosen CRAWLBACK by FRANK FROST as his favorite blues harp song for February. You can check it out by clicking HERE! THE ONE EYED CATS blues harp player Early A King$ has chosen LITTLE WALTER'S INSTRUMENTAL by WALTER HORTON as his favorite blues harp song for January. You can check it out by clicking HERE! As we enter 2018, we would like to thank you for your ongoing support! 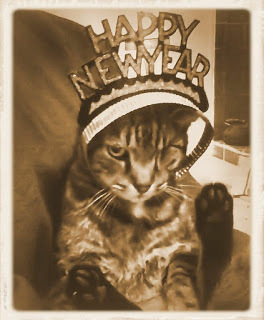 HAPPY NEW YEAR FROM FEMME FATALE RECORDS AND THE ONE EYED CATS!